Translated from Turkish from Cem Özmeral’s book Özlediğim İstanbul. 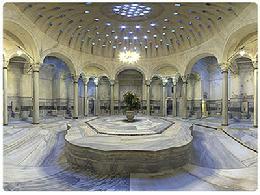 The Hamam in Bulgurlu was a smaller one compared to the ones in Galatasaray and Kocamustafapaşa. 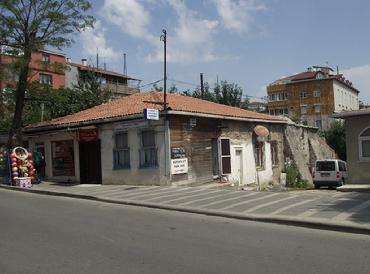 I remember the owner of this Hamam was an old Armenian Madam(1). From the front door of the Hamam you would enter into a courtyard with marble floors with wooden stairs on both sides of the foyer called camekan. From the stairs you would go into the balcony of the loft surrounded with several cubical dressing rooms with glass doors. Once you undress in these rooms you would wrap the peştemal(2) around your waist put the takunya (3)on your feet and go downstairs, give your wallet and valuables to the Madam for safe keep. From here you would go behind the glass doors to an area called soğukluk(4). This soğukluk was a relatively cooler transit area designed to adjust your body to the temperature change in the inside of the Hamam, where the temperature was very hot and the rooms full of steam. The soğukluk had a narrow wooden door leading to the inside of the hamam. As soon as you entered from the door the hot air, steam and humidity would hit your face, slowing down your breathing in the hararet or hot room. In the middle of the hararet room covered with marble from the floors to the walls there was a circle shaped huge round marble pedestal called the Göbektaşı(5) heated from underneath. People would lie on this Göbektaşı for few minutes to soften and activate their skins, whıle watching the rays of sunlight coming down like a reflector from hundreds of star shaped windows on the dome shaped ceiling. The circle shaped room with the göbektaşı in the middle had several marble water basins called kurna(6) around the walls. All of these kurnas were decorated with raised reliefs of flower motives, had copper hot and cold water faucets and silver capped water cups called hamam tası(7) Once you laid down here for few minutes, you would go and pick a kurna and start pouring down the water with a hamam tası over your head. If you wanted to get your body rubbed with a kese(8) you would ask the keseci (kese man) to perform this for a small fee. Since in those years the shampoo did not exist you would use a bar of “Hacı Şakir or Puro” soap to cleanse your body. Personally I could bare this heat and steam bath for only thirty minutes and at the end I would make a shock treatment for myself by pouring cold water on my body and leave the room for a breather in the soğukluk. Here in soğukluk the hamam attendants would bring clean peştamals to exchange with wet ones and offer you a cold Çamlıca Gazozu(9). After resting here for few minutes you would take the soft and fresh lavender smelling bath towels and go upstairs to the dressing rooms. After dressing up you would go down the foyer to pay the Madam and give bahşiş*(10) to the attendants who were lined up on both sides of the exit: The peştemal man, the towel man, The kese man, the takunya lady and the small children who just sprayed lavender cologne to your hands. Once you were out of the door the chilly winter air would hit your face and you would feel refreshed and energetic as if you just came out from a workout facility. (1)Madamme, or older lady. (2)Peştemal: The traditional towel used in Turkish baths. Made of 100% cotton dries quickly and perfect for warm and humid environment. Compact and lightweight, dyes are colorfast. (3)Takunya wooden slippers (4 )Soğukluk : the intermediary cooling area (5)Göbektaşı is the marble pedestal bed called the belly-stone (6) Kurna is the small wash basin without a drain hole. (7) Hamam tası: little copper or silver embroidered cups to dip into kurna and pour water on you (8)Kese is the hand glove made out of...ç the rub and clean the body (9)Çamlıca Gazozu the Sprite like soda pop, Çamlıca being the brand name and gazoz meaning soda before the Coca Cola era. (10) Bahşiş: tip money. I had written the above article over ten years ago. Today I realize what I had described in detail was a combination of the small hamam in Bulgurlu and bigger ones I had frequented as a child and as a youth in Istanbul. 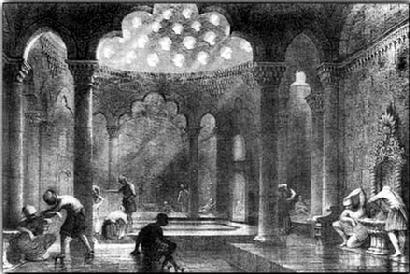 The Ottomans had inherited the hamam tradition from Byzantines and the Romans. The water is a sacred thing in the Moslem tradition and the Koran requires its followers to wash themselves with running water five times a day before prayer. When Sultan Mehmet II. conquered Istanbul he found several cIsterns in the city which were used to store water for home usage. The Ottomans never liked still water hence they used the water in the cisterns to water the gardens of the palaces while they brought running water to the city from the hills surrounding Bosporus by building several aqueducts. The water then was distributed to the fountains called çeşme and to the public baths called hamam and in later years of the Ottoman empire to the palaces. During the next five centuries after the conquest thousands of hamams, çeşmes and drinking water fountains called sebil were built in the city. For a devoted muslim one of the the best things to leave behind was to build a çeşme or sebil for people to use long after the deceased was gone, expecting a prayer from the user of the fountain a prayer to the builder's soul. In every neighborhood there was a çeşme where people filled up their containers with water and carry it home. The drinking water was usually brought the same way from a spring water sebil and kept in clay storage jug at home. Although it was possible to heat the water and take a bath at home, because of the scarcity of the water and transportation difficulty people would prefer to go to a public hamam once a week to thoroughly clean themselves. When I was a young child I had the opportunity to live in several districts of Istanbul in my grandmother's, uncle's and aunt's homes. In my uncle’s wooden house in Bulgurlu, a neighborhood of Üskudar on the Asian side, where I spent several summers as a very young teenager in the early sixties, there was no running water in the house. We would often go the neighborhood çeşme and bring water in plastic tanks to the house with my cousin Bülent. The drinking water was obtained the same way on a weekly basis from a spring sebil several steps under the ground level at the village square. And of course we frequently visited the Bulgurlu Hamam which I had described in detail above. On the other hand when I was much younger at the age of five or six, the circumstances were a little different at the three story wooden kiosk of my grandmother in the Kocamustafapasa district in the Historic Peninsula of the European side of Istanbul. There was running water in the house, which my grandmother called “terkos”, named after the lake the water was pumped from. There were five big storage tanks dug into the ground in the garden to accumulate rain water to be used to water plants and vegetables in the garden and to clean floors in the house. There was a big clay drinking water storage jug in the kitchen, the water being supplied by the "sucu",the water man from his horse carriage on a weekly basis. An unusual amenity in the early 1950 ies for most homes in Istanbul, a small refrigerator which my grandmother called frijder(Frigidaire)to keep the water cool in bottles was also placed in the kitchen. And finally a private hamam adjourning the kitchen with a wood stove to heat water and a kurna with water faucets. It has been over forty some years since I went to a hamam for a bath and I don’t know when I will go next. But on my recent trip to Istanbul, when I was walking in the historical peninsula I realized from the steam and humidity coming out from an old building that I was in front of the famous Cağaloğlu Hamam. This wasn’t planned but I did not hesitate for a second to go into this very historic bath and at least to take some pictures in the areas which were open to tourists. The historic Turkish bath Cağaloğlu Hamamı is one of the 1000 Places To See Before You Die, listed in the a New York Times best seller by Patria Schultz. 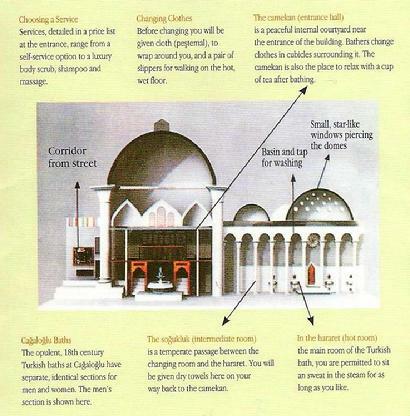 And rightfully so, the historic hamam was built in 1741 in the Eminönü district on the formerly Hilal -i Ahmar Street, now called Yerebatan Caddesi as one of the a finest examples of Ottoman architecture of several hundred hamams in Istanbul. It is a so called çifte(dual) hamam for both men and women with separate entrances, on the main and on the side streets respectively. Both of these twin hamams still operate today, seven days a week in a very accommodating and tourist friendly atmosphere. In addition to what you will find in a regular hamam there is a beautiful marble fountain with a waterjet in the “camgah”, the courtyard, with low seated round marble tables and chairs around the fountain, for coffee and tea service.The hamam has also a restaurant inside called the Old Marble Cafe, a barber shop, a nature health shop and hairdresser, a gift shop where you can buy peştemals, keses and old fashioned soaps, a hookah bar and kese and massage services in the steamroom. The front entrance of the men’s hamam which is reached with stairs going down the street level is decorated on one side with paintings of all of the thirty six Ottoman Sultans who ruled the empire during five centuries. On the opposite side there are pictures and photographs of famous people who have visited the hamam at one time or another : Florence Nightingale, Kaıser Wilhelm II ,Franz Liszt, Tony Curtis, Omar Sherif, Kate Moss and several Turkish celebrities to name a few. Next time you are in Istanbul if you want to visit a real authentic Turkish bath my recommendation to you will definitely be the Cagaloglu Hamamı.